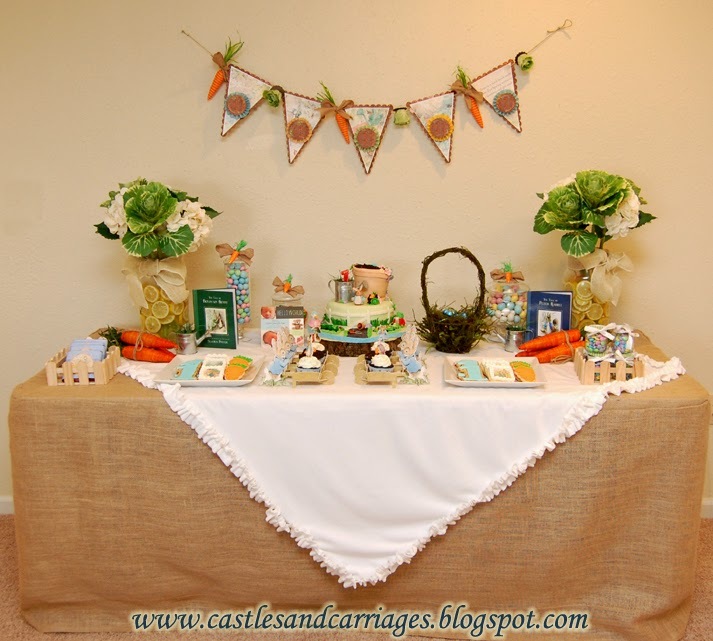 Welcome to my Peter Rabbit dessert table! 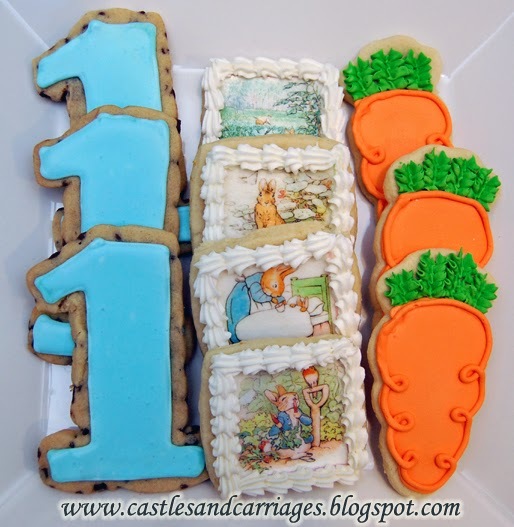 We just celebrated my son's first birthday with a Peter Rabbit theme. Michael's had these adorable kale/cabbage flowers for Spring so I pretty much cleared out the store getting as many as I could! Using large glass Ball jars that I already had, I filled them with lemon slices, faux white hydrangea and cabbage flowers. 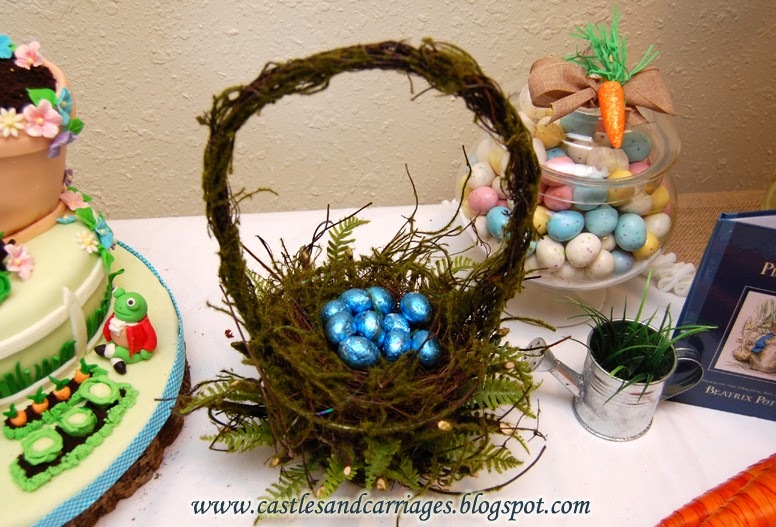 This moss basket is from World Market this year. I filled it with some blue foil wrapped chocolate eggs. Here is a closeup of the cookies (the edible wafers were from SayItWithCookies on Etsy). 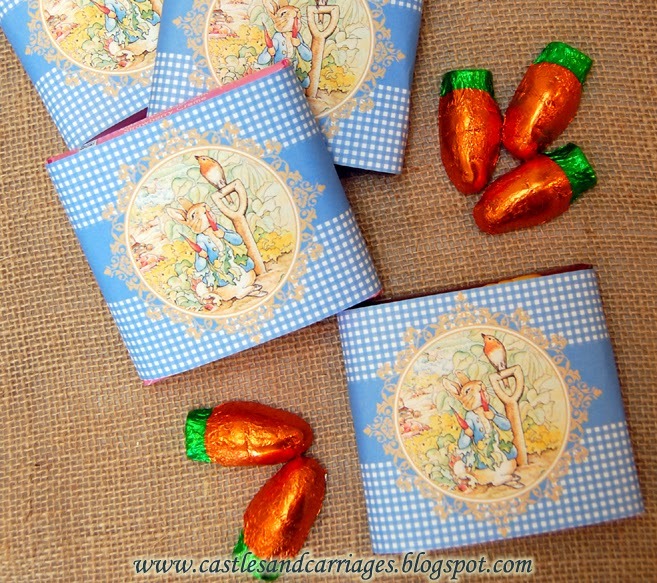 Using Beatrix Potter images online, I created these Peter Rabbit chocolate bar wrappers in Photoshop. The Peter Rabbit books were from the dollar bin at Target this year. 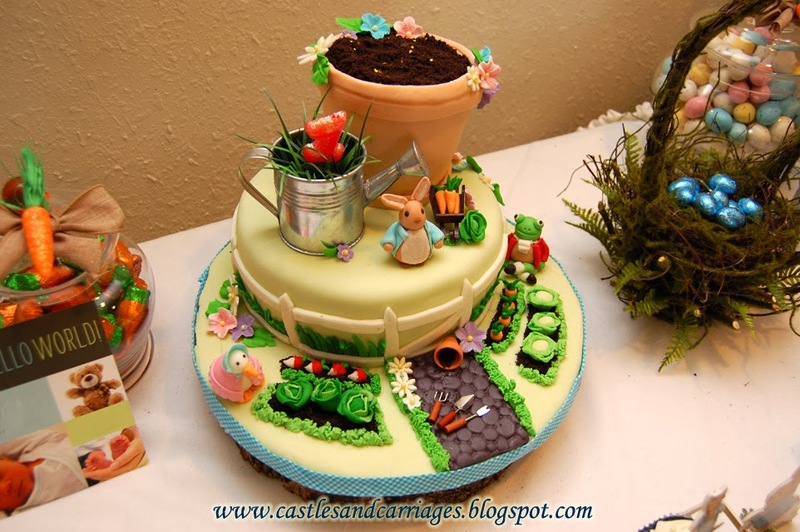 The Peter Rabbit wheelbarrow cupcake holders and toppers were purchased online (The Beatrix Potter Shop in the UK). Each apothecary jar was tied with a burlap ribbon and accented with a sparkly carrot ornament (from Michaels). Last of all, probably my favorite project, is the cake. It took me 4 days from start to finish. The bottom layer is a chocolate cake and the terracotta pot is actually a vanilla cake. The figures and flowers are made of gumpaste. The watering can is from Michaels. Love the Peter Rabbit wheelbarrows, do you have the location on line where you bought them? Love the cookies, and again I totally love the cake. Gorgeous! Thanks Candy! The company that makes them is called Meri Meri. At the time I purchased them, it wasn't quite Easter and no one in the U.S. was selling them. So I purchased them from The Beatrix Potter Shop in the UK but, sadly, they're no longer available. The only place I was able to find them now is the UK Amazon site: http://www.amazon.co.uk/Peter-Rabbit-Wheelbarrow-Cupcake-Holder/dp/1615866485 Good luck! i love the dessert table too! i was looking for those peter rabbit cupcake holders a week ago and found them on amazon here in the us. the silhouette cutting machine has a cut and print file for some of the peter rabbit characters. i am thinking of making a version of these by myself!! i think i have the wheel barrow pattern figured out! So awesome you found them! Maybe the search words I used were weird. I found them on Amazon (US) version too! http://www.amazon.com/Peter-Rabbit-Cupcake-Holder-Birthday/dp/1615866485/ref=sr_1_1?ie=UTF8&qid=1396807837&sr=8-1&keywords=wheelbarrow+cupcake+holder How do you like using the silhouette? I've been curious about getting one but have heard mixed reviews.